ON A MISTY, MOISTY MORNING A YOUNG TURTLE STOOD AT THE EDGE OF LILYPAD POND. SHE SPENT SO MUCH TIME HERE THAT CURLIQUES OF MOSS BEGAN TO GROW ON HER BACK. And in time Mossy's carapace sprouts more than moss--flowers and ferns and mushrooms that flourish on her back. Mossy seems not to notice that she has become a mobile garden, ﻿but someone else does, a handsome young turtle named Scoot, who cannot help falling in love with Mossy’s beauty. They are happy together in own little world of pond and woods. But Mossy’s exotic loveliness is also noticed by Dr. Carolina, a botanist who decides that the place for Mossy is in her botanical museum, in a fine habitat with a small pond and everything she believes a turtle might desire. Mossy soon becomes the superstar of visiting school groups who are charmed by the sight of a four-legged flower garden. But Dr. Carolina’s observant niece, Tory, notices that Mossy does not have everything a turtle might desire in her snug terrarium. To the good doctor’s mind she is safe and provided for, a fine living exhibit for nature study. But to Tory, Mossy is clearly lonely. Can Tory persuade her scientifically-minded aunt that there is more to life than security as a curious and beloved specimen? Can she convince Dr. Carolina to return Mossy to her own pond and to her mate, Scoot? 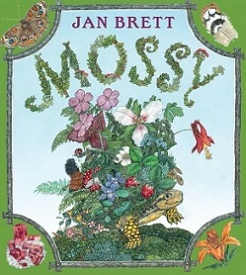 Of course, in Jan Brett’s just-published Mossy (G. P. Putnam's Sons, 2012) the happy ending for Mossy and Scoot is never much in doubt, but the fun is in getting there, turning through Brett’s exquisitely decorative illustrated pages, surrounded with her usual detailed borders of varied pond life and corner medallions that foreshadow what is happening back at the pond–the lonely Scoot--and what comes next. Brett’s lavish and lissome artwork, done up in gouache and watercolors, with its detailed flora and fauna and its human characters in picturesque turn-of-the-twentieth-century dress, allows for much poring over, and kids will love the ending page, with Scott and Mossy smilingly surrounded by all their young ones. "A quirky and very satisfying tale of nature and home," says Kirkus. I am a new follower, and I think this preview sounds great. It would be a good book for little ones. Welcome, Jasmyne. Glad to have you as a follower. I try!